We had already said this when presenting the tender that the undisputed favorite would be Toshikazu Yamanishi (JPN) and in fact the strong athlete of Japan won the race without any difficulty. What was perhaps not so sure was the splendid performance achieved: 1:17:15 which puts him in first place today in the seasonal world distance list. Yamanishi also gets the new personal best improving by 26" the previous of 1:17:41 obtained in Kobe (JPN) on Feb. 17, 2019. Also in this race there was no doubt about the victory of Ma Zhenxia (CHN). Sandro Damilano and Wang Yinhang's pupil dominated the test. It would seem that Toshikazu Yamanishi has also competed for All Japan as he ranks first in the final standings. 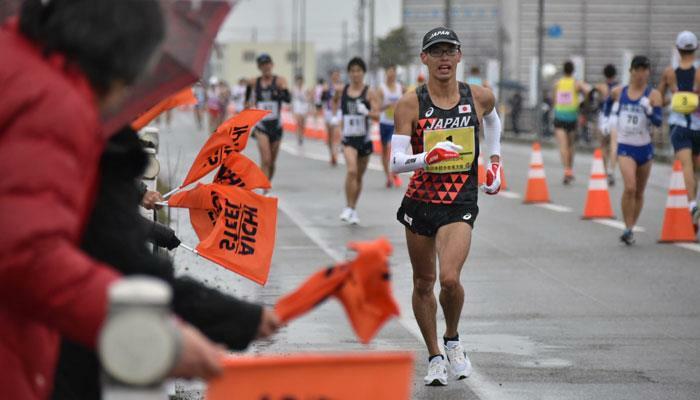 The race was certainly exciting as the first three athletes stayed together for over 18km, while at the 15 km mark (58:00) there were still five (Toshkazu Yamanishi, Koki Ikeda, Masatora Kawano, Isamu Fujisawa and Yusuke Suzuki). In the last two km Yamanishi has stretched and won with a gap of only 9 seconds on Masatora Kawano (JPN) in 1:17:24. For him too this is the new personal best; previous of 1:19:52 obtained in Kobe (JPN) on Feb 17, 2018. Only in third place was the first athlete in the world ranking, Koki Ikeda (JPN), who finished in 1:17:25. For him too this is the new personal best; previous of 1:18:01 obtained in Kobe (JPN) on Feb 17, 2019. Fourth place to Yusuke Suzuki (JPN) in 1:17:47 which represents his second all-time performance after the World Record of 1:16:36 established here in Nomi on Feb. 16, 2015. Suzuki unfortunately after that season remained injured for over two seasons following inguinal problems. Fifth place, and last of the athletes under the wall of 1:18:00, Isamu Fujisawa (JPN), in 1:17:52 which represents his new personal best (previous of 1:18:23 established in Kobe, JPN on Feb. 19, 2017). In the lead four athletes up to 5km (22:52): Chiaki Asada (JPN), Kaori Kawazoe (JPN), Ai Michiguchi (JPN) and Masumi Fuchise (JPN). In the last 5km she slows down the pace by setting a time of just 24:08, which however is sufficient for victory in 1:32:23. Great performance by the young Zhang Jun (CHN), trained by Sandro Damilano and Wang Yinhang. The not yet twenty-one-year-old Chinese (will be his birthday on Jul. 20, 2019) won the open race with a time of 1:20:17 that would have placed him in sixth place overall after the battleship of Japan. This performance represents his new personal best that lowers the previous time of 1:22:52 obtained in Huangshan (CHN) on March 3, 2018 by 2:35.